The influence of Mexican-American musicians on L.A. punk is undeniable thanks to key bands like the Zeros, Plugz, Bags, Stains, Suicidal Tendencies, Los Crudos et al sporting either partly or entirely Chicano/a lineups, but the full story really has yet to be told. That’s partly due to a schism in the L.A. scene—bands from East L.A. really didn’t get to participate much. In a segregated and cliquey city, East L.A. bands weren’t typically prioritized by a scene centered in the more affluent West Side areas where all the clubs were located. But as ALWAYS happens when a sufficiently motivated creative scene is stifled or confined, a vibrant DIY ethos emerged. In 1980, East L.A. venue The Vex began supplementing a thriving gymnasiums-and-backyards gig circuit, and a creative community grew, a community that included the Boyle Heights band The Brat. Formed in 1979 and fronted by vocalist Teresa Covarrubias, the band purveyed an irresistiblecatchy, poppy, sound that was underpinned with punk aggression, politically conscious lyrics, and three-chords-and-a-cloud-of-dust arrangements. They were championed by Plugz/Cruzados main man Tito Larriva, who in 1980 released their 5-song E.P Attitudeson his Fatima label. They also released, on the 1983 Los Angelinos: The Eastside Renaissance compilation, a song called “The Wolf,” which sounds for all the world like an inspiration for Concrete Blonde’s indelible “Still in Hollywood” riff. 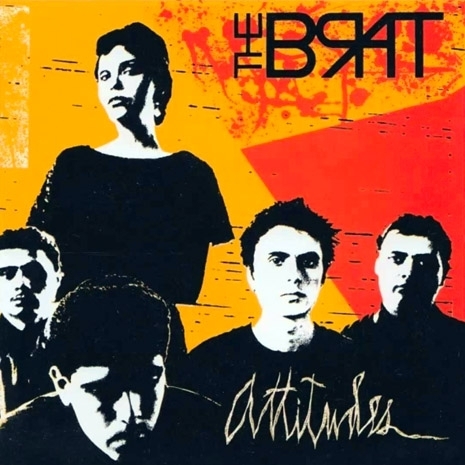 The Brat became one of East L.A.’s foremost bands, but despite opening for the likes of X, R.E.M. and Adam and the Ants, they faced a lot of apathy, eventually including their own. Tired of struggling against a segregated scene and unable to secure a deal with a record label despite their excellent rep, the band broke up in 1985. Covarrubias eventually went on to form Las Tres with Alice Bag and Odd Squad’s Angela Vogel, and The Brat remained relatively obscure compared to most of their contemporaries. Fans and collectors who want a copy of Attitudes can expect to drop about $100 (as of this writing there’s a copy on Discogs for a bargainous $85), but that won’t be necessary for long. Rock Beat Records will be releasing Straight Outta East L.A. this week, and the 21-song 2XLP includes new mixes of the five songs from Attitudes plus never-released sessions with Doors/Janis Joplin producer Paul Rothchild. BONUS! Here are a couple of clips featuring interviews with Teresa Covarrubias. Her segment in the Beyond the Screams documentary starts at 4:10 if you don’t want to watch the whole thing…but you should watch the whole thing.